Cheltenham racecourse is situated in Prestbury Park, near Cheltenham Gloustershire. In its scenic location and with a 67,000 person capacity, it’s a popular racecourse with the general public. It hosts one of the most highly anticipated events in the racing calendar, the Cheltenham Festival. The Cheltenham racecourse has two courses running alongside one another, named the old course and the new course. There’s also a separate cross country course inside the main used, which is used for steeplechase events. The impressive 2000 seat ‘Centaur’ auditoria is often used to host concerts and conferences. 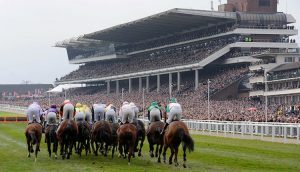 The four day Cheltenham Festival is a national hunt extravaganza taking place over four days in March of each year. It features such highly anticipated races as the Arkle Challenge Trophy, the Queen Mother Champion Chase, the Stayers’ Hurdle and the Cheltenham Gold Cup. All of these four races are Grade One affairs, in fact 14 of the races held over the course of the festival are Grade One races. Dating back to 1860 the festival draws huge crowds, with a ‘Cheltenham Roar’ being let out by those in attendance as the first race starts. Hundreds of millions of pounds are bet on the Cheltenham Festival over the four day period, and the quality of the races is second to none. Horses like such Kauto Star and Best Mate have Cheltenham (esp. the Cheltenham Gold Cup) in part to thank for contiburing heavily towards their legacy. Other noteworthy races take place at the course including the BetVictor Gold Cup and International Hurdle, though the main focus on the year is most certainly the Cheltenham Festival itself. In recent years heavy investment (£45million) has taken place in the redevelopment of the course, including the addition of the new Princess Royal Stand.